"How do we set the Primary Contact?" Our first HubSpot client asked "How do we set the Primary Contact for an organisation?". I couldn't figure it our so I contacted HubSpot support. Their suggestion was to type the name and email of the Primary Contact into a Custom Field in the Company. You can imagine the emojis I wanted to use for that reply. You know how hard it is to keep your CRM data clean and tidy – copy and pasting or typing names and email addresses is not a sensible workaround. So, we coded our own solution. Version 1 of the HubSpot CRM panel allows you to see the Primary Contact of a Company from a CRM Panel. You can drag the CRM Panel up the screen if you need it to be more visible. You can click on the link to go to the Primary Contact's record in the HubSpot CRM. From the panel in the CRM you can also choose the Primary Contact for the Company. We're still developing Version 2 of the widget. We've completely rebuilt it from the ground up and we're looking to add more features in 2019. See the Primary Contact in the Company record. Use the Actions to set the Primary Contact for a Company. The Contacts you can select is restricted to people "associated" with the Company (so you can't accidentally add someone from another Company). Confirm your changes after you make the change. Create Lists* based on the Primary Contact. Run Workflows* based on Primary Contact. We've got more features planned and we're keen to get your feedback. Please contact us if you'd like to try the HubSpot Primary Contact Widget. 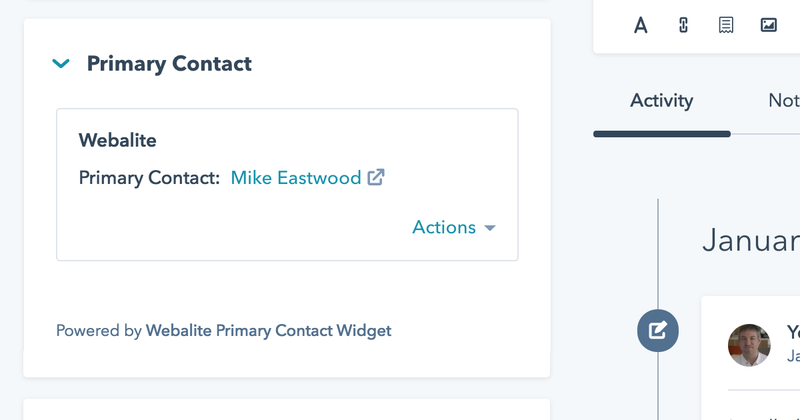 We delayed the launch because we wanted to test the Primary Contact Widget with the new HubSpot CRM layout (which I love). The good news is that it's all running well and we've made a few improvements. Please register if you'd like to be part of the Beta Programme.